Asus Chromebook C200MA-EDU-4GB is a fast and powerful 11.6 inch HD LED display budget computer with a dual-core Intel 2.16 GHz processor, up to 11 hours of battery life and Chrome OS that offers a slightly different but nice daily web based computing experience with a minimalist approach and feels and looks a lot like a Google Chrome browser and comes with an integrated virus protection so evil attacks will nowhere be as much of a concern as in Windows laptops. ASUS Chromebook C200MA comes with the Intel Celeron Bay Trail-M N2830 dual core processor (1MB L2 cache) at 2.16 GHz base speed up to 2.41 GHz with turbo when needed, 4GB DDR3 RAM at 1600 MHz, 32 GB EMMC + TPM of local flash storage plus free 100GB of Cloud based Google Drive storage for 2 years, Linux based Chrome OS operating system to work mainly with internet applications. 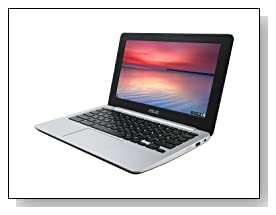 In a Chromebook you have the hardware of a standard notebook computer and a Cloud client so it has a class of its own in portable systems. Glossy finish 11.6 inch High definition widescreen LED display with a 16:9 cinematic aspect ratio, native resolution of 1366x768 pixels with vibrant colours- able to support 720p HD video playback, powered by integrated Intel HD Graphics that is adequate for daily multimedia and light gaming. You can play songs and stream videos easily online and you will hear proper sound through its built-in stereo speakers. It has a high definition webcam with microphone for Google hangouts- Skype is not available on Chrome systems yet. Screen is not Full HD or Retina caliber, viewing angles are OK and sound is not super amazing but more than sufficient for a low price Chromebook- adequate multimedia capabilities. 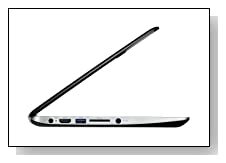 Minimalist black finish Asus Chromebook weighs 2.5 pounds with measurements of 7.90 x 12 x 0.80 inches- slim and lightweight- compact and highly portable with up to 11 hour battery life advertised by the manufacturer- will fit in any bag and you can be out and away from power outlets all day long. The 3-cell lithium ion battery for up to 11 hours of battery life. It has a regular chiclet style notebook keyboard and a large touchpad to navigate on Chrome easily, Gigabit dual-band 802.11A/C Wi-Fi for ultra fast web browsing, a USB 3.0 port, a USB 2.0 port, an HDMI port to hook up to larger external HD displays or HDTV, a 3-in-1 Media Card Reader (SD, MMC, SDXC), Bluetooth 4.0 to wirelessly connect to Bluetooth enabled devices wirelessly and a 1x 1/8" (3.5mm) Headphone/Microphone Combo Jack. Conclusion: ASUS Chromebook C200MA-EDU-4GB , like other Chrome systems is designed for a web-optimized experience with a more user-friendly interface than a regular Windows laptop. 802.11 ac faster internet was not available at the original launch of Asus Chromebooks but was added later on- which was a good decision by the way and you will notice the difference in speed and coverage. 32GB SSD means you will get overall snappy performance- boot up in just a few seconds and wake up from hibernation instantly. If you do use the computer mostly for web related things and connected to internet, Chrome OS would be for you and in terms of apps you will get Chrome web browser with a file manager and a built-in media player pre-installed. Asus Chromebook is a great little computer for your everyday tasks and your files will always be safe- backed up in Cloud. It comes with a 12 month limited warranty by Asus, including accidental damage protection and 30-day zero bright dot guarantee, also a great customer service 24/7 via phone and online.